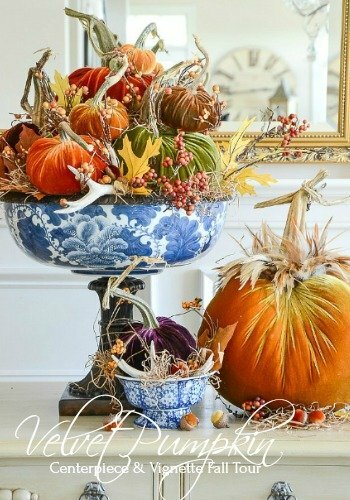 I am so excited about today’s post because several of my favorite home blogger’s have teamed up to do a fall blogger tour/blog hop highlighting all of the creative ways to style velvet pumpkins in centerpieces and other pretty vignettes. A big welcome to The Creativity Exchange for those of you new to my blog and visiting as part of today’s tour! I’m Cyndy and I’m so glad that you’re here! A big thank you to Yvonne from the beautiful blog StoneGable who organized the tour for us. 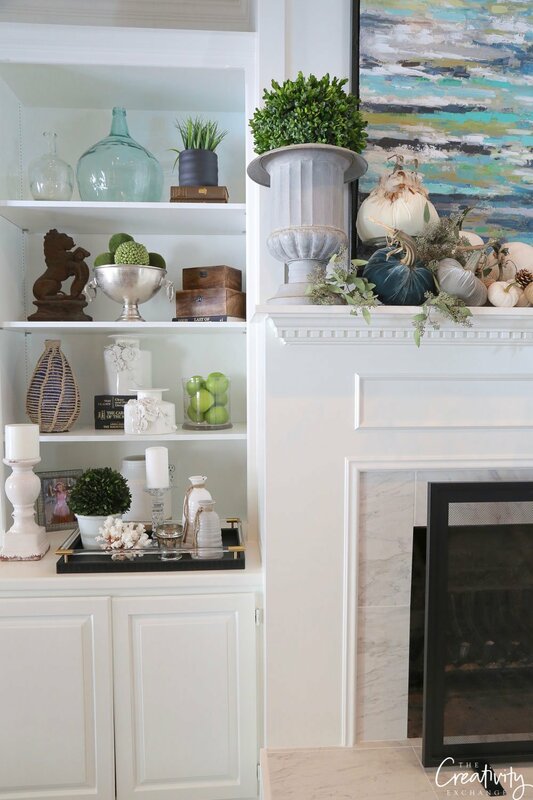 You can follow along the tour by visiting the other bloggers participating for more styling ideas and inspiration listed at the end of today’s post and be sure to check back each day through Wednesday with new bloggers posting each day! 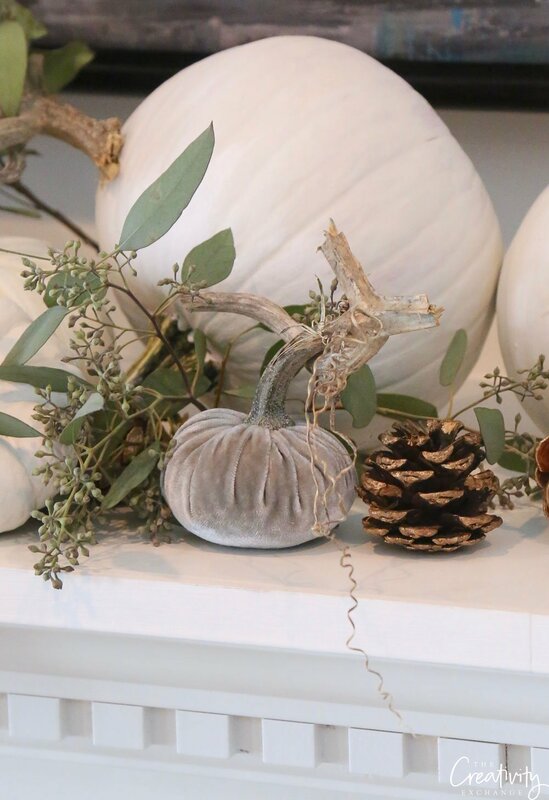 Now on to how I styled the velvet pumpkins! 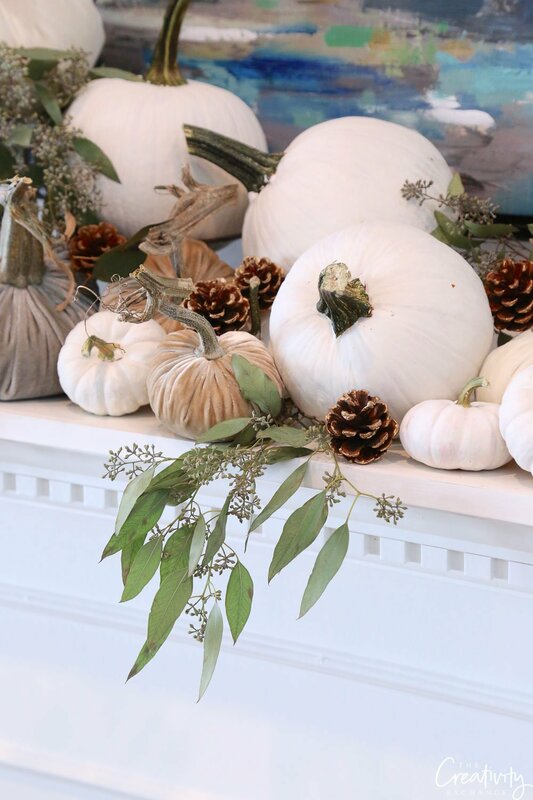 Velvet pumpkins are such a pretty and fun way to decorate during the fall because unlike real pumpkins, velvet pumpkins will last forever. 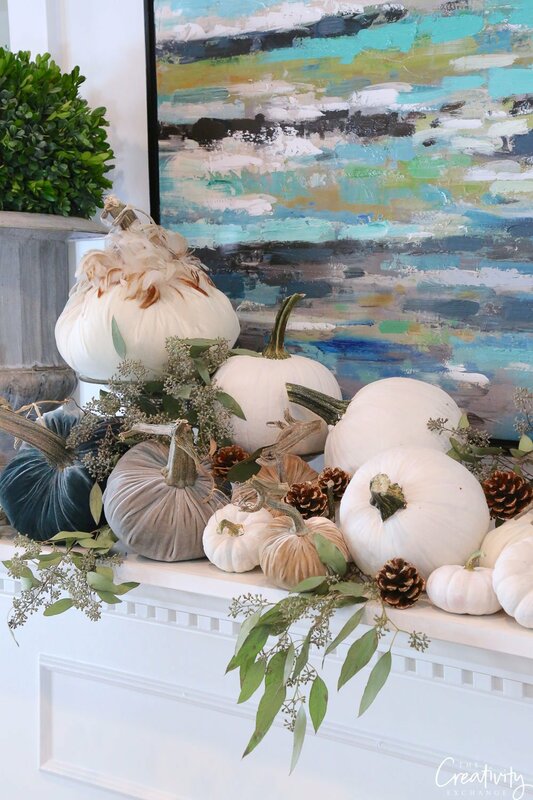 I especially love the HotSkwash pumpkins because their pumpkins have real stems, which is such a beautiful combination next to the velvet! 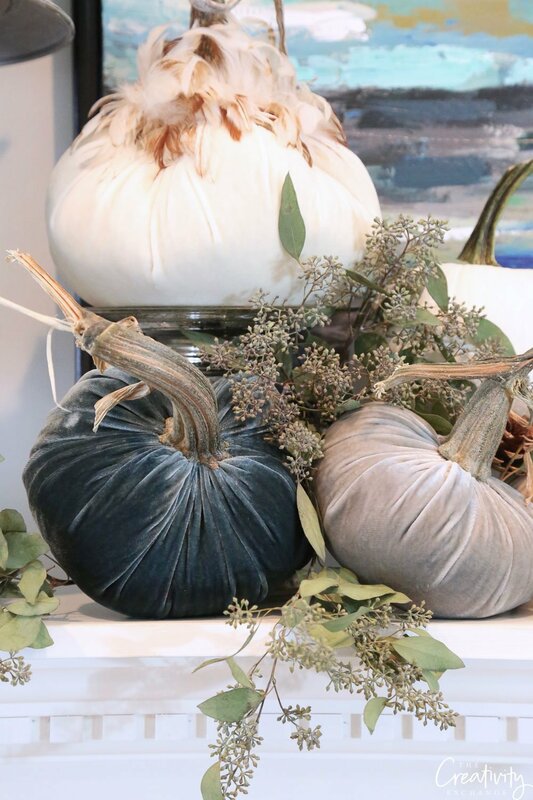 There are so many creative ways to layer and style velvet pumpkins! The possibilities are endless as you guys will see on this blogger tour! 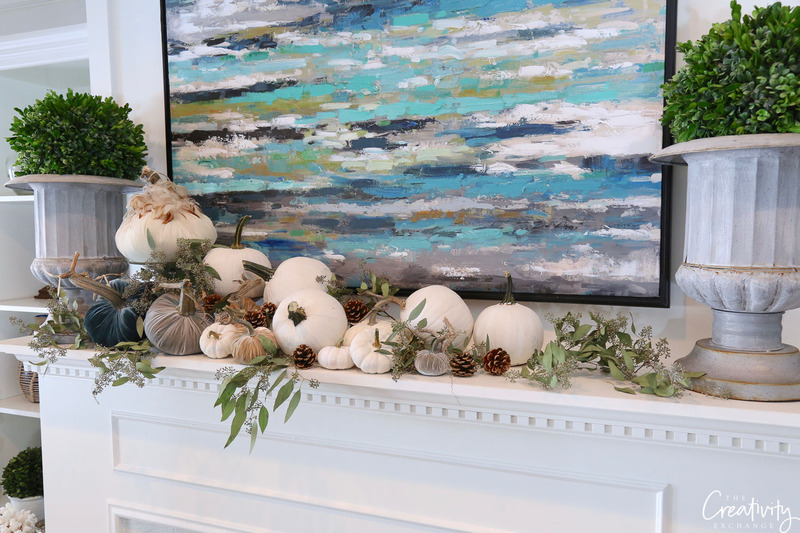 I decided to use my velvet pumpkins on my living room mantle mixed with white pumpkins, pine cones and seeded eucalyptus. 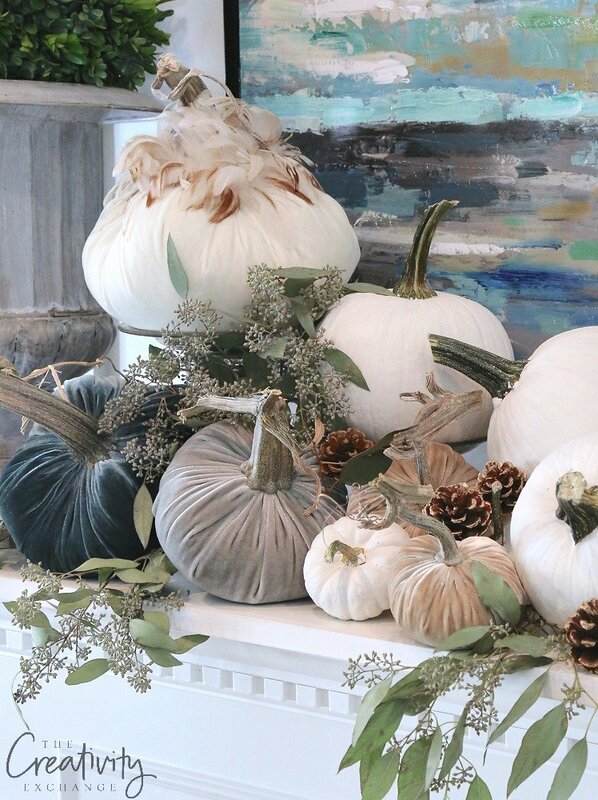 I wanted white pumpkins for my mantle but here in East Texas, it’s too early for pumpkins, so I painted pie pumpkins with gesso and I think they turned out so pretty! I also ordered a large ivory one with feathers! 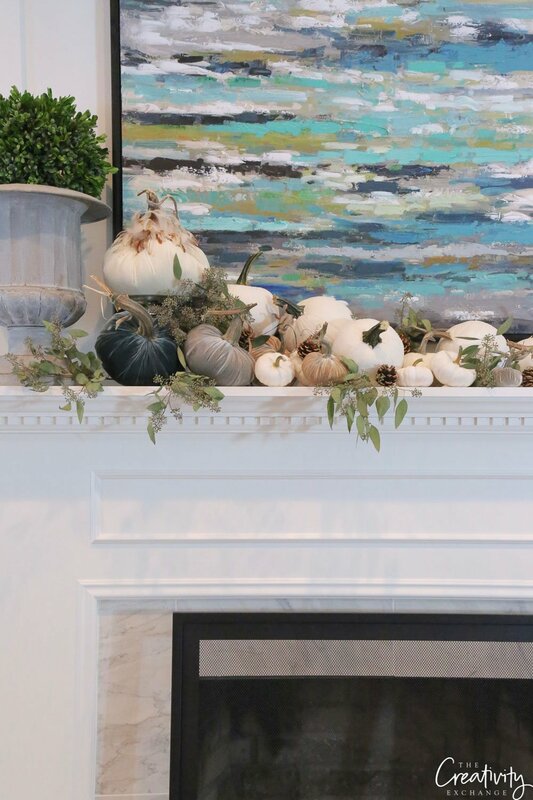 The cool thing about decorating a mantle with pumpkins is you can use various size candles holders to elevate pumpkins and if you slide another pumpkin in front of the candle base and fill with greenery and you won’t see the candle holder. I like to mix and match the angles that I layer the pumpkins just to give interest. 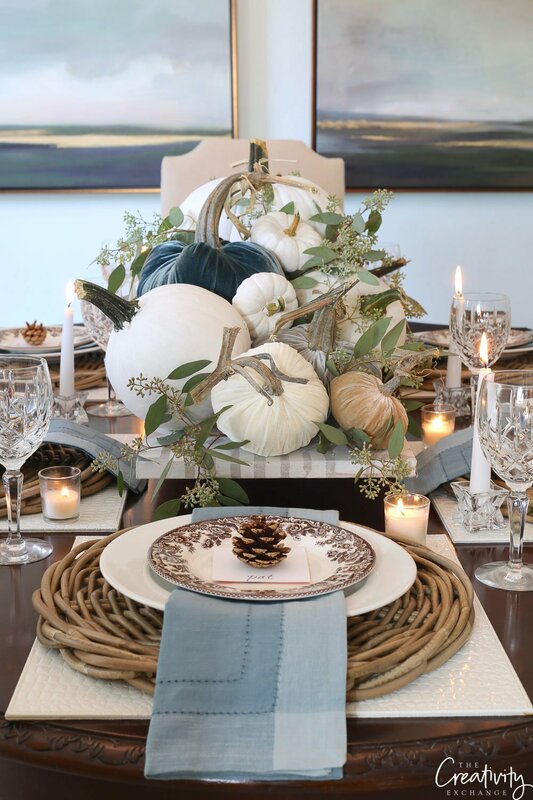 Wherever you decide to style pumpkins for the fall, you can incorporate pinecones, greenery and branches from your yard, pinecones and even dried flowers! 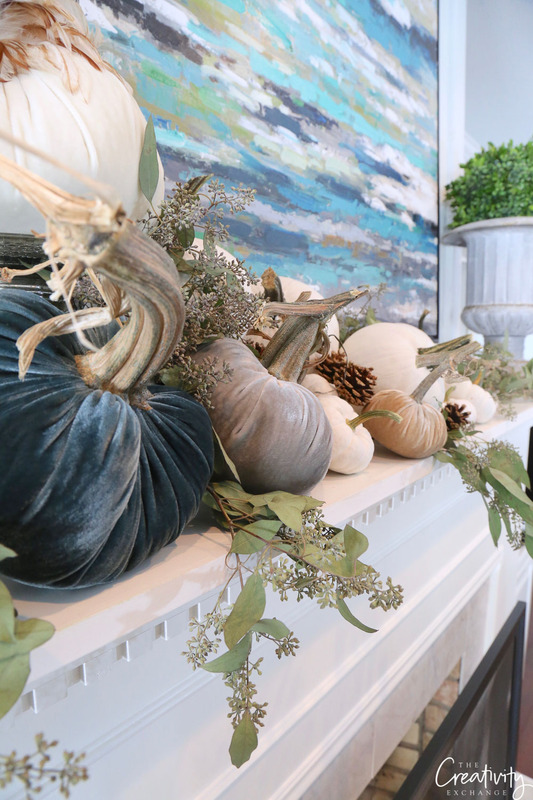 If you want to see more easy fall decorating ideas, you can see me 5 minute fall decorating ideas here. Now it’s time to move on to the other bloggers in the tour today! You’ll find links to their blogs below. Check back here tomorrow and Wednesday for more bloggers participating! 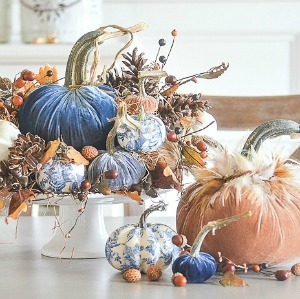 Come back tomorrow to see more beautiful pumpkin inspiration! This is gorgeous. Love the way your display is on a sliding scale…so creative and fresh. make me want to clean, put away summer accessories, check out my stored fall items, and do some shopping therapy. Cynde, Thanks so much for joining this tour. 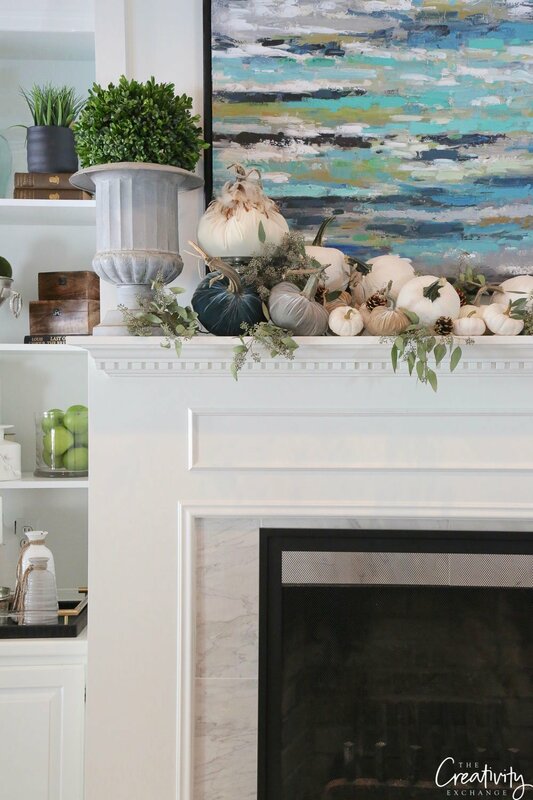 What a stunning mantel. 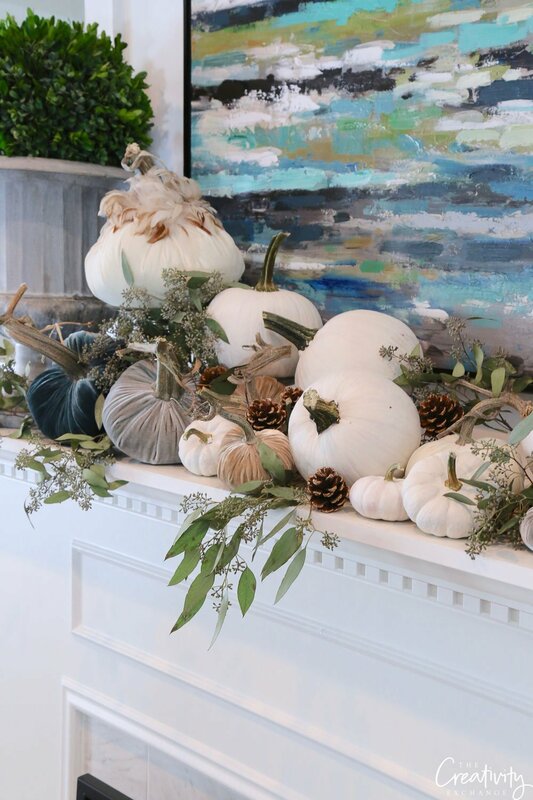 The perfect place to put those beautiful velvet pumpkins. And you certainly picked the perfect ones! They work so well with your painting! Cyndy, how absolutely beautiful your mantel looks!! I love the asymmetry and the colors you chose to work with your home style! Just lovely!! 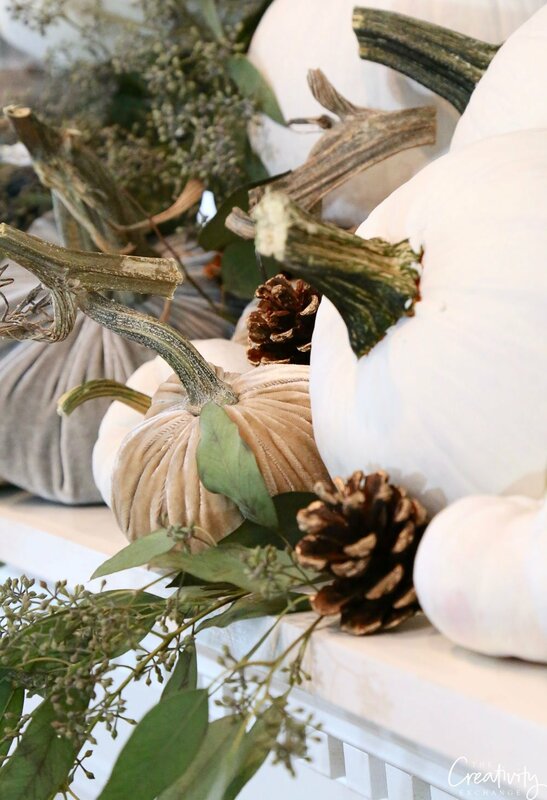 I love love love decorating for Fall because of all the pumpkins! I only have 2 velvet ones though, I think I need some more! I love your vignette, Cydny! It’s so pretty and matches your artwork perfectly! Hi Cyndy! Do you remember the gold color of spray paint you used on your frames for your framed Rifle Paper calendar prints? There are too many golds to choose from and I love the way yours turned out! Thank you! 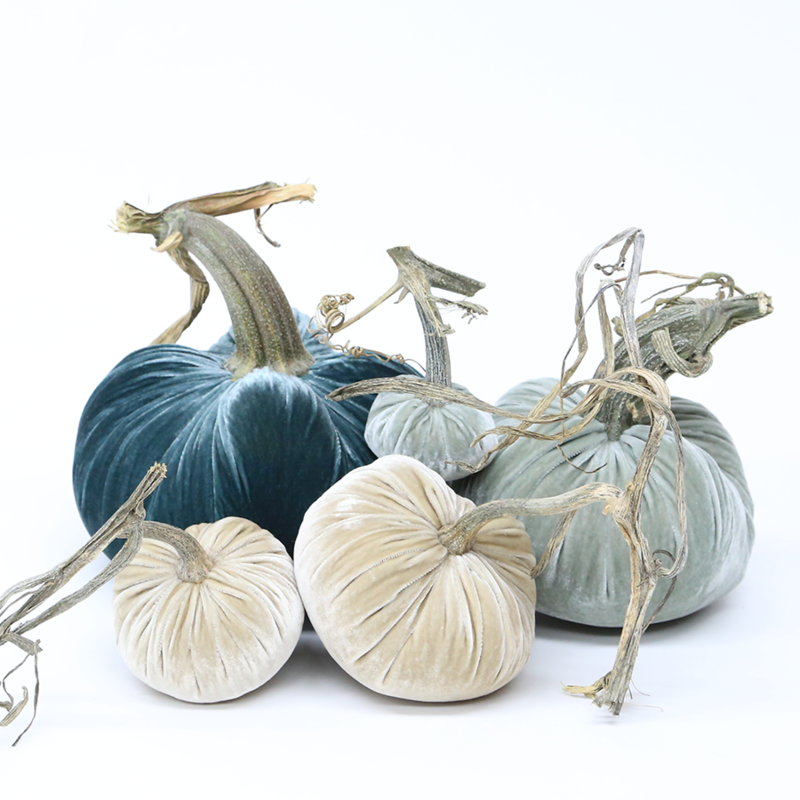 I love the velvet pumpkins! So elegant, but at the same time, earthy. 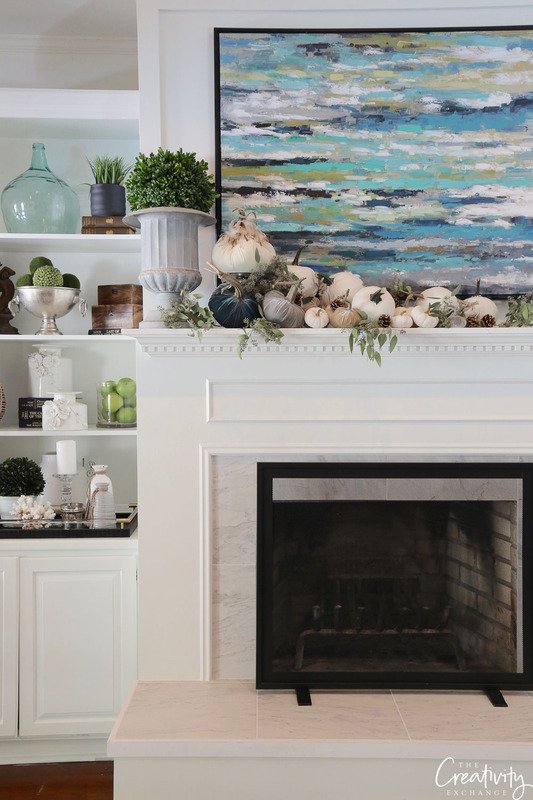 Your mantle is perfection from the colors to the textures to the styling. Sooo pretty! Your mantle vignette is elegant. 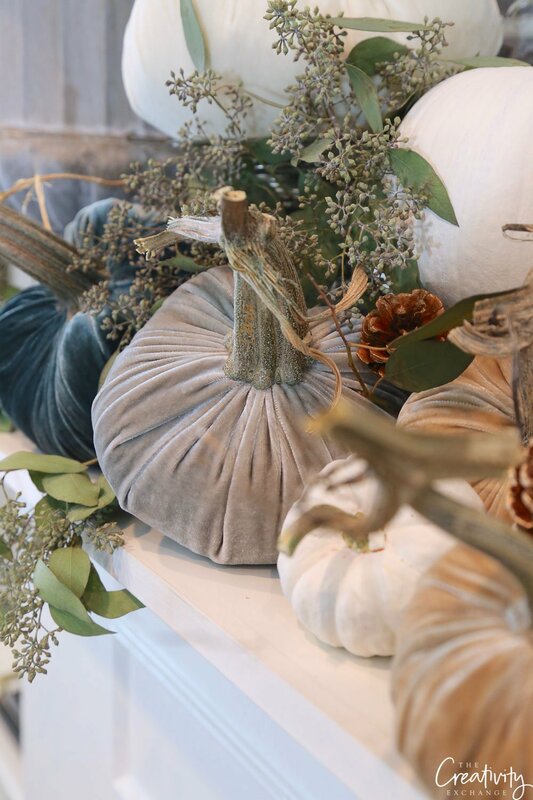 The velvet pumpkins certainly take fall decorating to a new level. I enjoy your blogs and always get great ideas. Thank you. 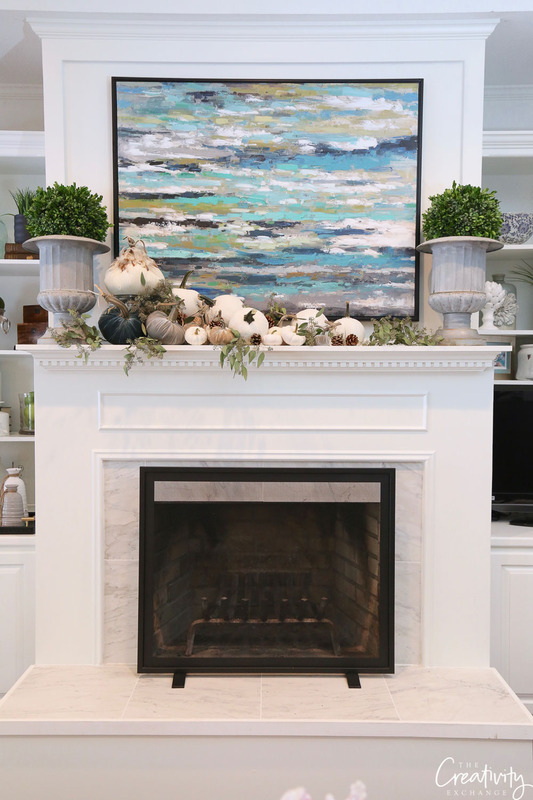 Would you please share the source where you purchased the art above your fireplace. It’s prefect for a project I’m working on. I have to say it is disappointing when these contests are open to US citizens only. As a regular reader and commenter, I feel left out. I would have no problem paying for delivery or picking up on my next trip down. And to the sponsor, I shop American often. Just saying…. The giveaway is open to anyone Joanna but they will only ship to U.S. addresses. You could sign up and if you win, have your goodies shipped to a U.S. friend and then they can ship to you! 🙂 Good luck on the drawing! That wasn’t clear. I will know for future posts. Thank you! 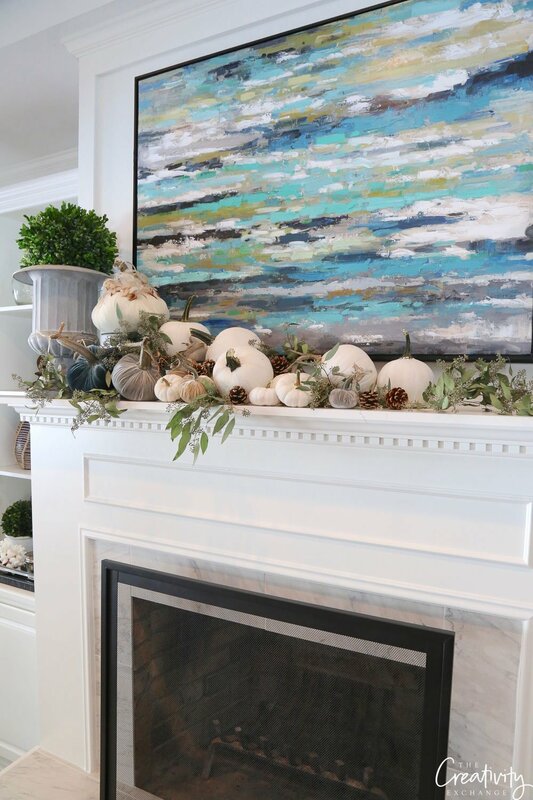 This mantle arrangement is just beautiful. I love the different sizes with fullness of each pumpkin. I am in love with love fest Web site and have already picked out what I would spend the gift card on. All the blogs did such a beautiful job arranging their pumpkins! Please enter me into the drawing. Gorgeous! Love the colors you chose. I am so happy to learn about this shop. Thanks for sharing as always.